Busy light field (BLF) is typically a collection of lights or indicators on a phone that indicate the status of the lines or other phones connected to the same Yeastar S-Series VoIP PBX. IP phone can subscribe the status of other extensions or trunks via BLF. With this feature those real-time status can be presented at DSS keys in IP phone (In this guide, we mainly take Yealink IP phones as example). It is important to note that this feature requires the support of both IP phones and IPPBX. IP phone which is interested in "PSTN lines" or "other extensions" status sends a SUBSCRIBE message to the Yeastar S-Series VoIP PBX for subscription authorization. Once subscription authorized Yeastar S-Series VoIP PBX will send NOTIFY message to the IP phone every time the subscribed target status has been changed. Note: This guide applies to S-Series (Firmware version 30.5.0.30 or later). In the following example, we all take Yealink T26 (version 2.72.0.1) as example. Value: Input the extension number or trunk name of Yeastar S-Series VoIP PBX you want to monitor. Line: Choose the account number, which is registered to Yeastar S-Series VoIP PBX. Extension: Input the feature code so that when this extension is ringing, you can press this key to execute an opeartion. In this example *04 means picking up the extension filled in the Value field when it is ringing. 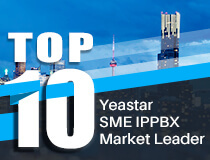 We could subscribe the status of Yeastar S-Series VoIP PBX extensions. For example, when extension 705 is ringing, we can press the DSS key 1 to pick up the incoming call. The pre-configured *04 will be sent to to do the call pick up. In this application we can monitor the status of call parking number, park the current call as well as retrieve the parked call. In the example below, if you are in an active call, you could press the DSS key 1 to park the current call. And press DSS key 1 again to retrieve the call if the parked call is not answered by others. Or if there is an incoming call already parked on number 6900 by others, we can press the DSS key 1 to answer the parked call. We have another way to make it happen. With the Yealink phone we choose the Type as “Call Park” and fill in the call park number. For other brands IP phone we are not sure if it works. Example: A user calls to extension 700, user 700 answers the call and presses the DSS key directly to park it to parking number 6900, user 706 use DSS key to answer the parked call. Step 1. Login the IP phone UI and select the DSS key and choose the type as “BLF” or “call park” type, follow the pictures above to finish the configuration. Step 4. User 706 hook off and presses the BLF key to answer the call. With this feature, you could monitor the line status, and seize the line to make an outbound call. Basically you could press to DDS key configure to "seize" the line. After hearing the dial tone, you could start to dial the number you want. Step 1. Check the trunk name on Yeastar S-Series VoIP PBX. Step 2. Configure DSS key on the IP phone, set up the "Value" field with the name of trunk. 1. SIP, PSTN, GSM, BRI trunk are allowed to be monitored in S-Series VoIP PBX as well as have "Seize-Line". But make you sure have configure outbound route the trunks. 2. Please choose the right line in the Line check box, make sure you have chosen the right one which is register to S-Series PBX. 3. PRI trunk could have "Seize-Line" feature, but no monitoring.